The paper “Computation of three-dimensional standing water waves“, co-authored by Chris Rycroft and Jon Wilkening, has been published in the Journal of Computational Physics. 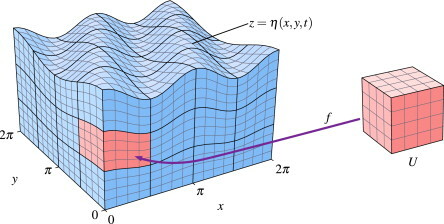 Using a finite-element method, with fourth-order elements, that are curved to match the free surface, the paper computes time-dependent spatially-periodic waves in a box. Several families are found in both the shallow and deep water regimes. The paper can be found here.